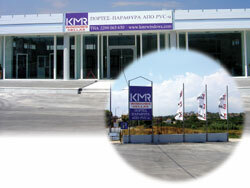 KMR was formed in 1998 by George Kritikos, who established its manufacturing base at Abbey Business Park in Belfast. After recognising a need in Greece for high quality windows, which do not react to high intensity heat, KMR set up a new showroom in Athens and looked to Signs Express to provide professionally designed signage for the new premises. Kritikos was delighted with the service provided by Signs Express: 'They have worked with us in the past and I am always thrilled with their quality. I fully support local businesses working together and have always been highly impressed with the standard of work I see leaving their production centres. I wouldn't hesitate to recommend them.' KMR required two main exterior signs for the showroom, one at the entrance to the car park and a main fascia sign for the showroom building. Signs Express Centre Manager, Cathy O'Donnell, said: 'We were very happy to provide signage for KMR's new office in Greece. Signs Express (Belfast) is part of the UK & Ireland's largest sign company with over 80 centres nationwide and is a member of the British Sign & Graphics Association.